This place really is for the birds. There is a history here. At the turn of the previous century, just a couple of miles down Figueroa Street (Dayton Avenue then) stood the world’s largest pigeon farm located approximately where the Home Depot in Cypress Park is today. The Los Angeles Pigeon Farm on the banks of the Los Angeles River in the foreground. Cypress Park developing in the background. Circa 1910. Photo via the USC Digital Library. In 1900 our predecessors here had a penchant for what today we would consider unusual meat sources. Just across the York Boulevard Bridge stood South Pasadena’s famed Cawston Ostrich Farm, where the giant birds were raised for their feathers and meat. Twenty-five years earlier, the now ubiquitous backyard critter, the opossum, was itself imported to Los Angeles from Arkansas to be used as a meat source. But when it came to squab, Cypress Park was king. Stereoscope of the pigeon farm apartment houses in 1903. Via Wikipedia. In 1898 T.Y. Johnson opened his ranch on the banks of the Los Angeles River near the confluence of the Arroyo Seco at Dayton and Avenue 20. Where San Fernando Road and Figueroa Street is today. The ranch had the benefit of being located next to all the major railroads, which meant easy shipping in the days before refrigeration. 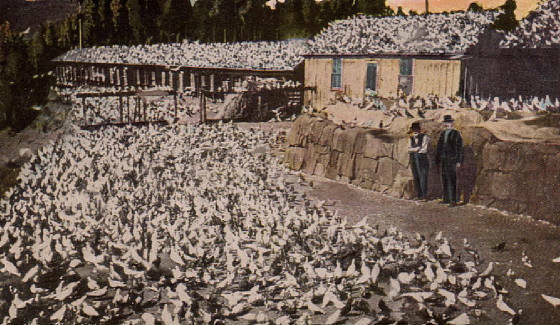 But more importantly, the pigeon ranch was in the center of Los Angeles’ milling district, providing ample sources of spilled gains for the birds to eat. The operation grew for many years, housing as many as 500,000 pigeons at one time. 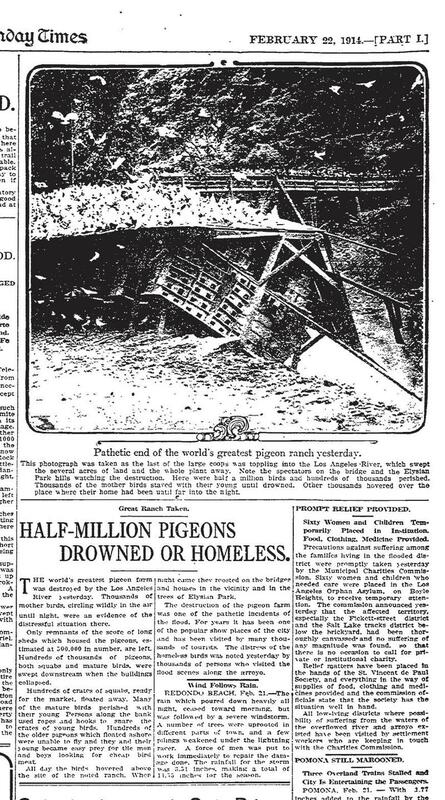 It all met a tragic end with the February floods of 1914 when the ranch was washed away, killing thousands of birds, and scattering thousands more across the Los Angels basin. The ranch never re-opened, but their descendants live on. 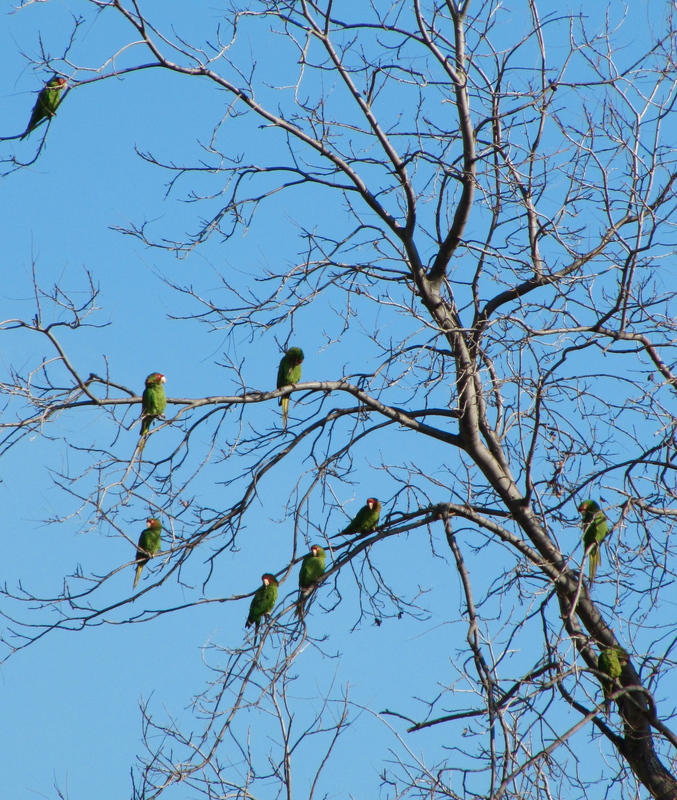 Another Highland Park fair feathered friend of curious origin is the Mitred Parakeet (Aratinga Mitrata) or Mitred Conure Parakeet, or Aratinga mitrata tucumana, sometimes refered to as the Parrots of the Arroyo, sometimes refered to as the Avian Cacophony Society. According to the California Parrot Project, they number over a 1000 in population locally. The insanely loud birds are native to east-central Peru to eastern Bolivia and northwestern Argentina, where their natural habitat consists of moist sub-tropical lowland forests. How they came to reside along the Arroyo Seco in South Pasadena, Garvanza, and Highland Park… no one is quite sure. One theory is that these birds are descendants of parakeets that were released from an aviary up the Arroyo Seco at the nearby original Busch Gardens when it closed in 1938. This would explain why the birds range is centered on either side of the Arroyo. Busch Gardens in the Arroyo Seco circa 1910. Photo via the USC Digital Library. Something to consider on Saturday, May 22, when an Illustrated Lecture and Walking Tour is given by Pasadena Heritage at what is left of Busch Gardens. The tour led by Michael Logan will explore what is left of the Adolphus (Budweiser) Busch estate, including the Old Mill, which is now used as a residence. Tickets are $22 for non-members and begins 10:00am at Westridge School, 324 Madeline Drive (at Orange Grove Blvd.) in Pasadena, 91105. Great Post. My friend Tash from Palos Verdes DP (she grew up in Highland Park) sent me the upper photo so I was delighted to see the story you’ve been able to dig up. When I was a kid over at the Arroyo Seco stables we were inundated by pigeons. Now I know why. Really cool info, about what used to be where in Cypress Park! I grew up here, and Iv’e got a Q: If any one can help, I heard that where Florence Nightingale Jr. High School is now, on the corner of N. Figueroa & Cypress Ave. , there used to be a big Victorian Mansion, that belonged to ( at the time around 1900’s? ), to the James Jeffries Family, He was the Heavy Weight Boxing Champion of the world , early 1900’s, I think that would be really cool, if there are any surving photos of the home,….. I was suggested this website through my cousin. I’m not positive whether or not this publish is written by way of him as nobody else understand such particular approximately my problem. You’re incredible! Thank you!